Thirty days hath September. Tomorrow starts a new month and a new way of eating around here. Join me in pledging to skip the fast food/take-out option this month. The holiday season will be here before we know it and we want to develop good habits before we get too busy. I’m busy. You’re busy. We are ALL busy. Believe me when I say I know how convenient it is to just pick up pizza, burgers, rice bowls, etc on the way home from soccer practice, ballet, PTA meetings, school, or work. Picking up dinner means it is one less thing I need to be “busy” doing. BUT I owe it to my family and myself to try harder and eat better and so do you. Overwhelmed? Don’t be! I am here to help! Sign up for my weekly newsletter below and I will email you recipes each week that will help you get dinner on the table! Today’s roundup will help you get dinner on the table in 30 minutes or less. You can do 30 minutes, I promise! Some of the recipes are slow cooker recipes so the actual cook time is longer than 30 minutes but you won’t have to do much to them once you get home and are ready to eat. Let’s help each other out. What are your favorite “get dinner on the table quick” tricks and recipes? Leave me a comment! It is only 31 days guys. We can do it together! In two weeks I will do another roundup post sharing 15 more recipes. Those baked tacos look awesome! One of my favorite easy dinners is pizza quesadillas. Just take a tortilla and put your favorite pizza toppings on half of it, then fold and cook it in your George Foreman grill. Only takes a few minutes! Yes! We called those pizzadillas in our house. They have been a go-to on busy nights. Some REALLY good stuff here! Lately my days have been CRAZY so when I’m not trying to develop recipes for my blog, I may have to turn to the easy, fast ideas! THANKS! You’re welcome Chrissa. I hope you find some inspiration. The timing of this couldn’t be more perfect. 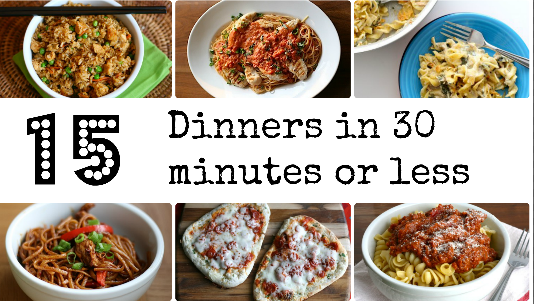 I’m usually great with 30 min or less meals but lately we’ve had just about 15 minutes each night to make dinner before we have to move on to the next activity. Quesadillas and nachos are always easy for us. That pad thai looks delicious! I’ve been neglecting dinner. This is just what I need. Never had peanut butter with noodles. Thanks for the idea! The peanut butter noodles were definitely inspired by the need for a quick dinner. Now they are a favorite that I crave often. Yes yes yes!! Honestly, picking what’s for dinner goes like this: how long will it take me? If it takes more than half an hour, I have to really consider how much I want that dish 😉 Thanks for the roundup! These look tasty. I might be (very) familiar with your process 🙂 Thanks for visiting Jenn! I love recipes that are quick and easy to make. This is a great list. Thanks for sharing! Under 30 minutes is how I roll in … and out.. of the kitchen. I was a single mom for 5 years before I remarried, I had no other choice but to cook and quickly. Some of these, I have never tried. I’m looking forward to the Naan pizza. 🙂 Thanks for sharing. Thanks Karin. I hope you’ve found some thing to add to the line up! I will def be trying these! I’m all about a quick meal. These recipes are perfect! Naan pizza for the win on my list! Naan + Pizza when that clicked I was in heaven. So quick and easy. What a great pledge and roundup you’ve got here! I’m a big fan of Taco Tuesday for a quick meal. I love the Naan Pizza idea! I might try that one next. Yes tacos have saved our family many busy nights! Naan pizza is a perfect quick dinner. Enjoy! These are all great recipes, thank you for sharing! I pinned to reference again!! 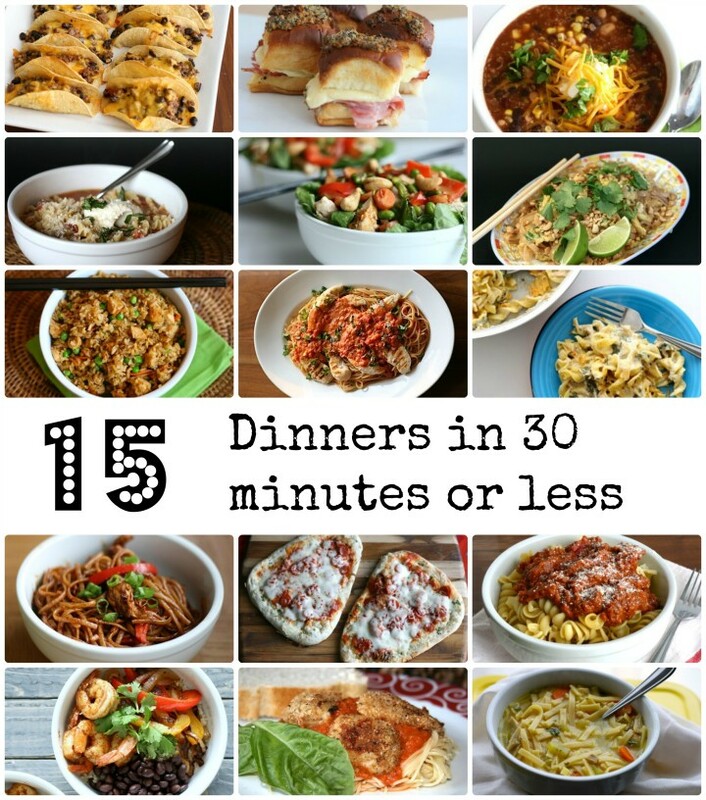 Such great dinner ideas! We need these at our house. So many great options to try I can’t wait to get started! Thanks Meagan. I hope your family finds something they love here. Yum! I love quick and easy dinner ideas. Thank you for sharing!